Passionate about sharing our Experience…..
Every year we organise numerous educationals for our agents. This year was a record year, Lorraine, Clare and I counted and counted and we think we had over 80 agents travelling around Botswana, Zambia & Zimbabwe on educational visits. Most trips were individually tailor-made trips, based on the needs of the agents. Around Indaba we had 20 agents on safari, one group in Botswana and one in Zimbabwe. Agents enjoying a helicopter flight over the Delta. This year one highlight followed the next. Recently Botswana Tourism organized the first “Botswana Tourism and Travel Expo” in Kasane. We were honoured to be part of it. 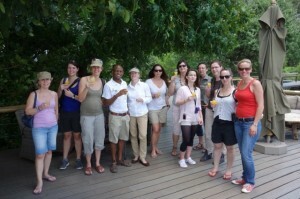 It was hugely successful as it hosted 81 Tour Operators from Germany, Switzerland, Austria, Italy, France and Belgium. These 81 agents were split into various pre- and post-Expo educationals of 4 – 5 nights each. 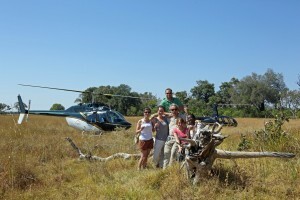 Safari Destinations partnered with Bush Ways Safaris and with Great Plains Conservation and put together three trips. 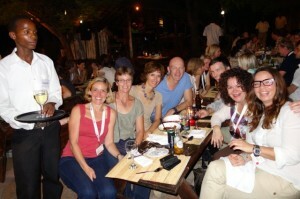 Dinner during the BTTE in Kasane – we had lots of fun. 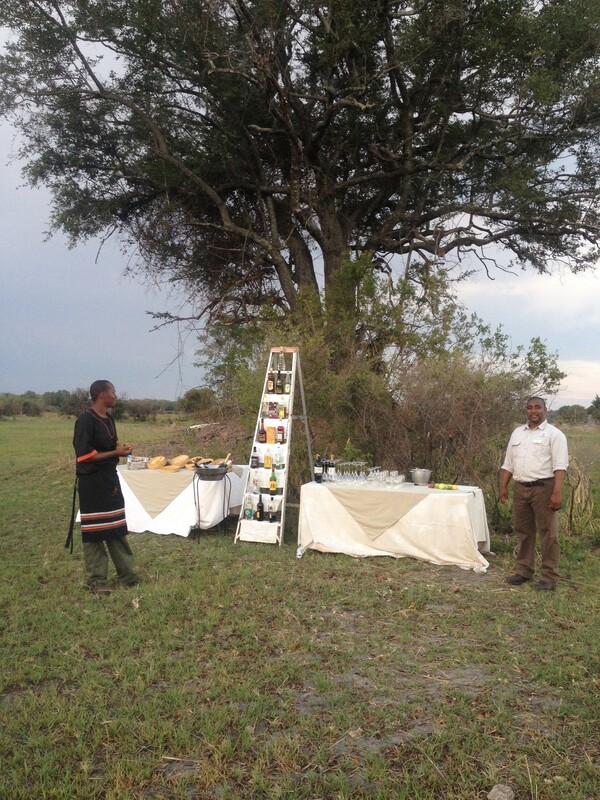 We always try to show our agents the beauty of the different regions as well as the different products on offer. 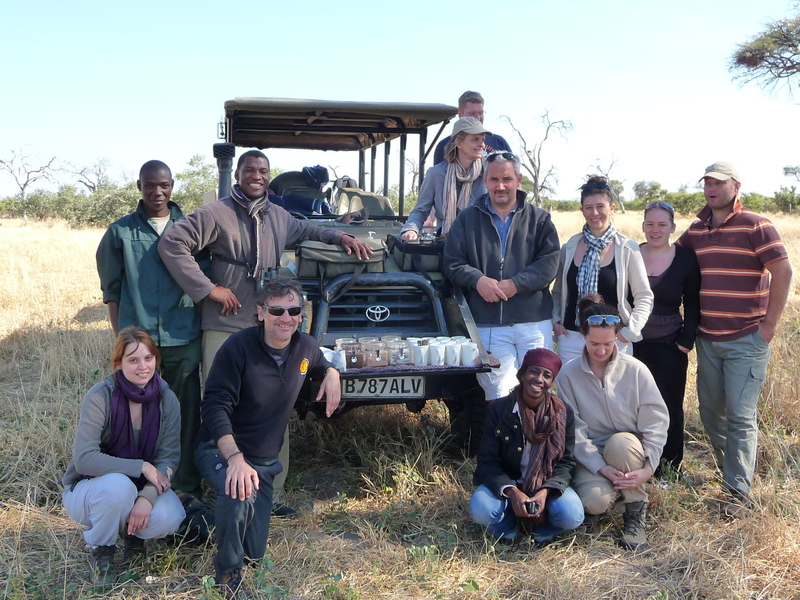 Last week’s agents’ safaris included nights at Selinda Camp, Ghoha Hills Camp, camping with Bush Ways Safaris in Savuti, camping with Letaka Safaris in Khwai, both Sango Safari Camp and Machaba Camp in Khwai and a visits to Meno a Kwena Tented Camp on the Boteti River & Jacks Camp on the Makgadikgadi Salt Pans. The agents enjoyed site inspections of three lodges in Chobe (Chobe Elephant Camp, Ngoma Safari Lodge and Chobe Game Lodge) and brunch at Zarafa Camp and Savuti Safari Lodge. 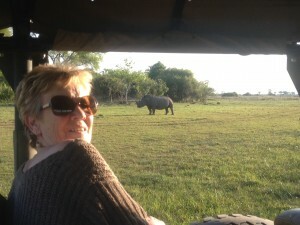 They experienced game drives, night drives and a walk with San Bushmen at Meno a Kwena. 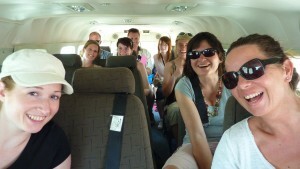 Flying to Selinda in a Caravan of Mack Air.